Black cats have long been associated with superstition. Worshipped by the Egyptians and adored by the Romans, ancient beliefs were that all cats (including black ones) were to be worshipped and to kill one was considered a capital crime. But by the 17th century cats were associated with witchcraft and considered evil. In witch trials, ownership of a cat was taken as evidence of witchcraft. Even today, in the United States, Belgium and Spain black cats are considered very unlucky – and a costumed witch during Halloween celebrations will often by accompanied by a black cat. In Britain the opposite is true and the association has long since changed to one of good fortune. To meet a black cat is considered good luck, especially if it runs across the path of the observer. There are some variants of this belief, such as that in Yorkshire, where it is lucky to own a black cat, but not to meet them. In other areas it’s said that a black cat as a wedding present is thought to bring good luck to the bride! For some reason, which could be linked to superstition, black and black-and-white cats in the care of Cats Protection are often harder to home. 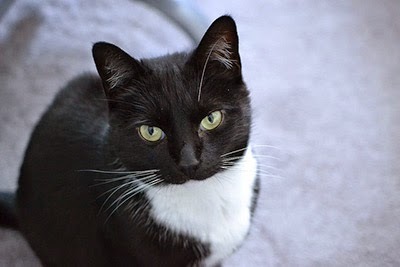 Gemma Smith, Cats Protection’s Digital Communications Officer says “Black and black-and-white cats make up around half of all the cats in our care – and sadly they wait much longer to find their forever home than the average cat”. That’s why we’re urging our supporters to share their tales of ebony cat ownership to show that a black cat is for life, not just for Halloween. If you’d like to consider homing a black cat, use our Find-a-cat search. We've had 5 black cats over the years & loved them all just as much if not more than any other cat we've had. They're beautiful shiny (or not if fluffy!) little stunners who love you as much as you love them. I told my local branch of CP I wanted a cat and not a fashion accessory. So the cat I have is black with a tiny splodge of white on her chest and I am not least superstitious about her. It wouldn't matter to me if she was black all over, or white, or any other colour. Cats cannot help the colour of their fur, just as you or I cannot help the colour of our eyes. People need to get over their prejudices.